Thinh Nguyen earned a B.S. from the University of Washington, and an M.S. and Ph.D. from U.C. Berkeley in 2000 and 2003, respectively. He co-authored several award-winning papers at major conferences. He is a recipient of the NSF CAREER Award and the Engelbrecht Young Faculty Award. 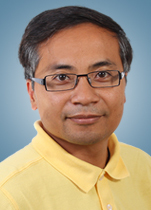 Nguyen is interested in theories and applications of all things stochastic. His current and past research projects span a number of application areas ranging from signal processing and video coding, to networking and communication, and recently quantum information theory.